n some of the most beautiful UTV trails in Colorado. This will give you the opportunity to take your family on trails to see sights they will remember. Rentals may be used as a homeschool educational trip to expose your kids to wildlife and a bit of history. Or if you are looking to just create some family memories our rentals are great for that as well. Imagine the family memories of taking your school-aged kids in a UTV to see a historic plane crash site. Upon seeing the wreckage, exploration and learning can begin. Hiking the trail up to the plane crash can give your kids an idea of how long ago the accident took place by the amount of growth that has occurred since the small plane came to its final resting place. The wildlife in the area is used to the sound of the ATVs and UTVs. So observing them as you ride along the trail is easy. While taking care to avoid getting too close, your kids can observe the habits of moose, elk, and deer as they go about their daily lives. Make your reservations with us at Estes Park ATV Rentals this fall. 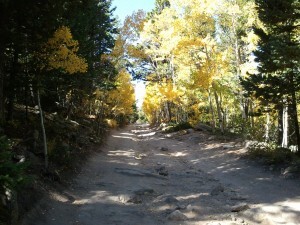 You will get to experience the Colorado aspens as they begin changing to beautiful fall hues. Take your kids on a fun trip and experience nature first-hand on the back of an ATV or from the seat of a UTV.